I’ve been making this recipe for months. I don’t even use a recipe anymore, as it’s been embroidered onto my heart, soul and tastebuds. I make a giant one-bowl dish of it just for me, as I think it makes a fine solo lunch. 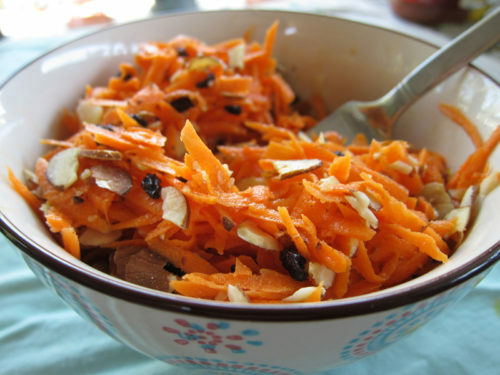 It’s sweet, tangy and crunchy, not to mention full of vitamin A and other good-for-you nutrients. I talk it up to friends and I’m actually surprised that I haven’t shared it here until now. It’s really, really good. I had taken home Dorie Greenspan’s Around My French Table from the library and it’s a gorgeous cookbook. I didn’t want to return it and I probably racked up some serious library fees just holding onto the darn thing. It’s going onto my Christmas wish list for sure. It was the only recipe I made from the book, but it’s one I’ve made every month since. Sometimes, several times a week even. You see, it’s weird my relationship with this salad. I crave it and think about it when I’m not eating it. It’s intoxicating and I’m clearly under its spell. Grating the carrots seems like a daunting task but really it’s not that bad. Especially when you know what’s waiting for you on the other side. Play your favourite song very loudly. 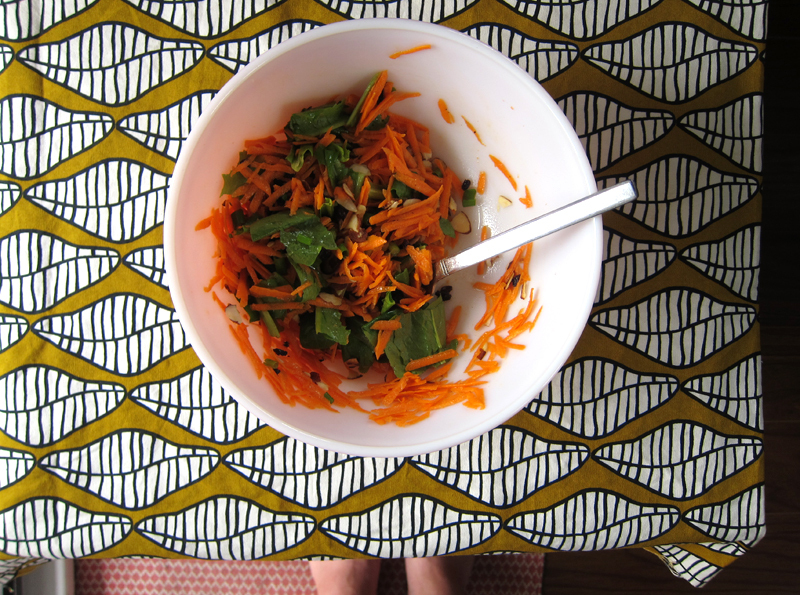 Listen to the Spilled Milk podcast (which I have to tell you is my most favourite thing to listen to when I cook) and grate, grate, grate those carrots into a pile of lovely orange shards. Toast some sliced or chopped almonds or walnuts in the meantime and have your currants at the ready (no silly raisin or dried cranberry substitutions, please). The dressing, a mixture of cider vinegar, oil, dijon mustard and honey, couldn’t be easier. Pour, mix, toss and eat up. You’ll find yourself putting this salad on repeat often and then thinking about it even more. I promise. Now, start grating. I mean it. The parsley, chives and green onion are ingredients I consider optional. They are lovely additions, but not essential. In the original recipe, Dorie also considers the currants and nuts optional. While I’m sure Dorie is wise and all knowing, listen to me and DO NOT skip these. They are, in my opinion, what elevates this salad into amazing territory. Also, currants trump raisins so don’t even think about it. I would also like to add now that it’s cold season, a clove or two of minced garlic to pump up the benefits, but it’s not needed. Use the large holes on a box grater to grate the carrots. All the carrots. In a small jar, mix the dijon, honey, cider vinegar and oil together. Add a pinch of salt and pepper and shake until well combined. Pour dressing over salad. Toss with handfuls of currants and nuts and the chives or parsley if using. Season again if needed and serve. Serves 4. 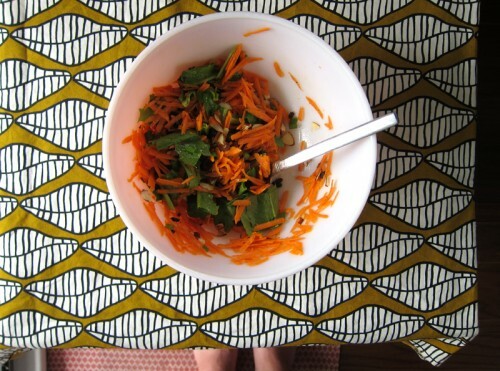 I probably would have never looked twice at this salad in Around My French Table but I’m so glad you pointed it out! It does kind of sound like a fabulous lunch salad option! There’s a similar recipe from Jamie Oliver that adds fresh cilantro. I’d never have thought of that combo but I love it. 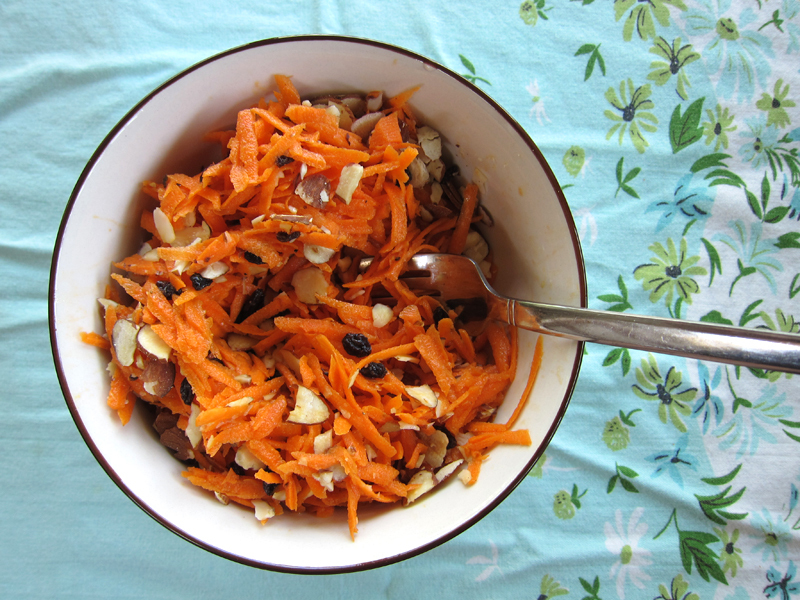 I just posted your wonderful chickpea and carrot salad on my blog and I think it’s all in the munchie, crunchiness of the raw grated carrot. 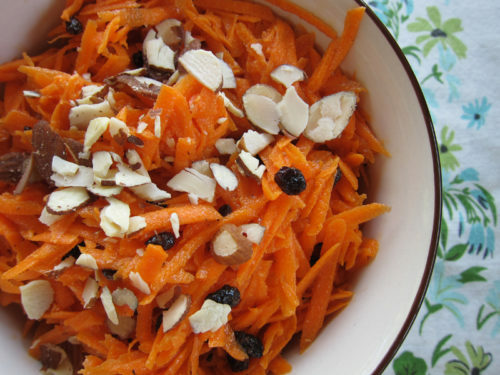 I will definitely try this grated carrot salad and will have to track down Dorie’s book. Funny enough, I have been making grated salads this week too. I made a yummy one with grated carrot and beet. I will have to add your recipe to my repetoire. Every single time I use a box grater I end up grating just a tiny amount of finger in with the food! Yuck! I am a complete klutz…. Ellen, good to know! I’ve added parsley but I’ll try cilantro next. Thanks Elizabeth, that’s a good one – but this one might have the upper hand. Hag, I have a carrot and beet one that I love too. But this one is pretty fantastic. I’m sure you’ll end up loving it. RMW, okay, maybe you need to use a food processor – no bloody fingers!! Yikes!! I made a grated salad last fall with a similar dressing and I wish I would have thought to add currants and toasted nuts! I can see how that would take it to another level. I have yet to get a Dorie cookbook, but her recipes are always great! Oh boy, tell me about racking up library fines! I’m so guilty of that. I’m now intrigued about Dorie Greenspan’s cookbook now. I have a growing wish list of books on Pinterest 🙂 So on that note, I have purchased a bag of organic carrots and I’m making this salad soon. Yum! Thanks Nicole, this one really works well with the currants and nuts 🙂 It’s a good favorite around here! Bijoux, get it out from the library (and try not to rack up fines!) It’s a really great book and I hope you try this out soon. I finally got Dorie Greenspan’s book out from the library. It’s amazing! I haven’t had any time though to pore over it in depth and to make anything. It’s been busy but I will try to make this carrot salad soon. It’s great, isn’t it, Joanne? I love it and would love to purchase it one day soon. Do try this salad – it keeps well so you can have it for several meals – just make sure to grate a lot of carrots!! This salad was so good!!! All the things that were different than what I’m used to, the dijon, the currants and the chopped almonds made it sheer heaven in my mouth!